Start your summer off on the right foot and sign your children up for swim lessons and these public pools. Before summer begins, hit the pool to practice your swimming skills, and take the time to teach your kids to swim, or sign them up for swim lessons at a local pool. According to the Long Island Drowning Prevention Task Force, drowning is the leading cause of death of children ages 1 to 4, which makes it all the more important that you educate your children as to how to be safe in and around the water. Most drownings occur in residential pools, and for every child that drowns, five others are hospitalized for non-fatal submersion injury, and as many as three suffer permanent brain damage. Giving your child formal swim instruction and providing supervision when swimming is the best way to keep your child safe. Take a look at these public pools that are open or are opening soon, and consider registering for a swim program. If you prefer to stay indoors, take a dip at the Nassau County Aquatic Center in East Meadow, which offers a 50 meter long pool for laps that also has a shallow area for recreational swimming and water walking. 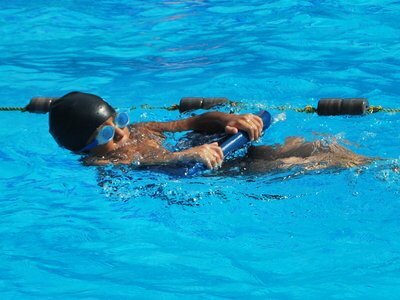 Swimming lessons are offered for ages 3 and up, and water exercise classes are offered for adults. Click here for a full list of swim program offerings at the aquatic center. Swimming lessons will be offered at four Nassau County pools for children ages 3 and up. There will be three sessions held this summer, and each session will be two weeks long and run Monday through Friday at a designated time. Each class is $65 plus a $5 registration fee. June 2nd: North Woodmere from 6:00 p.m. – 8:00 p.m.
June 3rd: Wantagh Park from 6:00 p.m. – 8:00 p.m.
June 4th: Cantiague Park from 6:00 p.m. – 8:00 p.m.
June 5th: Christopher Morley from 6:00 p.m. – 8:00 p.m. In Suffolk County, swimmers can dive into any of the eight lanes at the public pool at Suffolk Community College’s Brentwood Campus. Swim lessons are held Saturday and Sunday mornings, and aquarobic classes are held Monday through Friday at 11 a.m. Health club membership is $275 for an adult for a year, and $220 for a child for a year. Saf-T-Swim in Nesconset specializes in swim classes for kids and adults, and even offers one-to-one instruction that is incredibly effective at meeting the exact swimming needs for your child. Baby and me, small group, and swim team programs are also offered. YMCA is also one of the oldest swim instruction providers, and there are multiple locations across Long Island that offer swim classes for children ages 3 and up. Block Party Bonanza - Tips for Hosting a Great Gathering This Summer! Do You Know What Your Child Is Doing During Summer Vacation? Summer Parenting - Should You Go With The Flow? Subject: LongIsland.com - Your Name sent you Article details of "Swim Safely this Summer: Sign Your Kids Up for Lessons and Practice in these Public Pools"